Left photo: Clockwise from back left, Alumni Society President Mike Short ’99, then-Interim University President Herbert B. Keller, S.J., Col. James F. Cummings, M.D., FACP, FIDSA, U.S. Army (ret) ’88, H’15, Matthew R. Bernard ’99, G’03, William J. Brady ’83, P’12, Francis J. Pearn ’83, P’16, Dominique Ponzio Bernardo ’93, Michele Giancatarino Gilfillan ’98, Elena M. Habersky ’13 and John H. Appleton, Esq. ’68, P’00, ’03 enjoy a moment together immediately following the Frank J. O’Hara Distinguished Alumni Awards Ceremony June 8. Right photo: From left, University Director of Athletics Dave Martin, P.J. Carlesimo, son of Peter A. Carlesimo, former Lady Royals Coach Mike Strong, the Rev. Herbert B. Keller, S.J. H’06, then-interim University president, and Head Women’s Soccer Coach Colleen (Murphy) Pivirotto ’04 celebrate Strong’s career at the Carlesimo Golf Tournament & Award Dinner June 18. 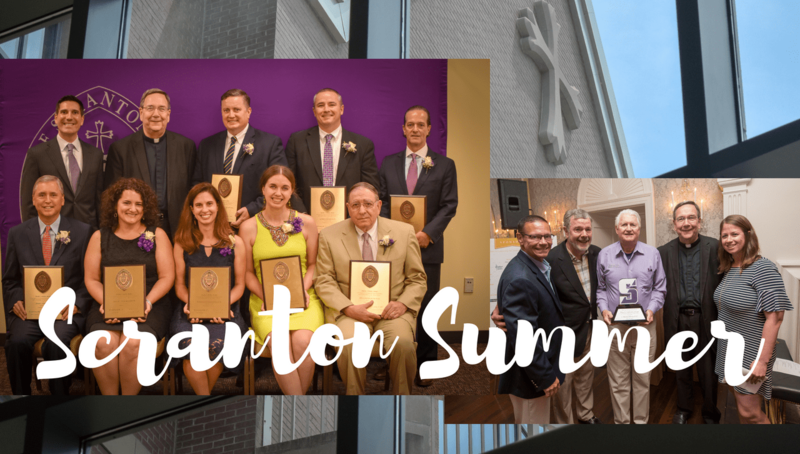 Hundreds of Scranton alumni successfully kept the summertime blues at bay during the month of June by reconnecting with their fellow Royals at Reunion Weekend and/or supporting Scranton Athletics at the Carlesimo Golf Tournament & Award Dinner. Reunion Weekend attendance this year exceeded all records as Royals in class years ending in “3” or “8” returned to campus June 8-10 to make new memories with old friends. Alumni celebrated their milestone reunions by raising more than $1 million for University scholarships and campus priorities. During the festivities, The Alumni Society and the University honored John H. Appleton, Esq. ’68 of Clarks Summit, William J. Brady ’83 of Wellesley, MA, Francis J. Pearn ’83 of Garden City, NY, Col. James F. Cummings, M.D., FACP, FIDSA, U.S. Army (ret) ’88, H’15 of Chevy Chase, MD, Dominque Ponzio Bernardo ’93 of Bridgeport, Michele Giancatarino Gilfillan ’98 of Bloomfield, NJ and Matthew R. Bernard ’99, G. ’03 of Clarks Green with the 2018 Frank J. O'Hara Distinguished Alumni Award; they also honored Elena M. Habersky ’13 of Cairo, Egypt with the 2018 Frank J. O'Hara Recent Graduate Award. The Frank J. O'Hara Distinguished Alumni Award is the highest award bestowed jointly by the University and the Alumni Society. The award honors select alumni who embody Scranton's Catholic and Jesuit experience and who have achieved distinction in their professional or personal endeavors. Honorees are selected based on the nominees' commitment to Ignatian values and their pursuit of professional and personal excellence. 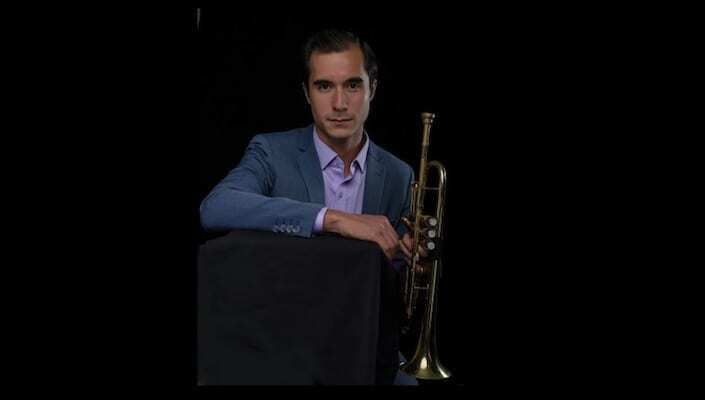 The Frank J. O'Hara Recent Graduate Award is presented to an alumnus/na who has graduated within the past 10 years. The award honors alumni who have demonstrated an outstanding commitment to service for others in their personal or professional achievements which embody Scranton's Catholic, Jesuit values. All alumni are invited to return to campus June 7-9, 2019, for Reunion Weekend, where Scranton grads with class years ending in “4” or “9” will celebrate their milestone years. If you would like to join your class committee, please email alumni@scranton.edu for additional information. Registration will open in March 2019. To learn more information or let your classmates know that you are planning to attend, visit scranton.edu/reunion and add your name to the “Planning to Attend” list. To see photos from Reunion Weekend, visit our Shutterfly page. The University honored former Lady Royals Coach Mike Strong June 18 with the 2018 Peter A. Carlesimo Award at its annual Carlesimo Golf Tournament & Award Dinner at Saucon Valley Country Club. More than 225 Royals attended the event, helping to raise more than $100,000 for Scranton Athletics. The University partnered with Title Sponsor Quandel Construction Group for this year’s event. In his 34 seasons as head coach of The University of Scranton's women's basketball program, Mike Strong accomplished things that no one else ever has. When he retired in 2014 with 815 wins under his belt, Strong ended his career as the all-time leader in career victories in NCAA Division III women's basketball history. Over the decades, he led the Lady Royals to 19 conference titles, 26 NCAA Tournaments and eight Final Four appearances, where the team captured the 1985 national title. Strong also coached some of the best athletes in University history, including 19 All-Americans and two National Player of the Year honorees. In addition, Strong mentored 11 different student-athletes who earned Conference Player of the Year or MVP recognition. During his tenure as head coach, he never had a losing season, and he is the only women’s coach in NCAA Division III history and the second in all of the NCAA Division III to win 800 games. His overall record is 815-182. Strong's career at the University began well before his appointment as head women's basketball coach. After graduating from Concord College in West Virginia in 1967, he joined the University as an assistant men's basketball coach in 1972 under then-Head Coach and 2016 Carlesimo Award Recipient Bob Bessoir. Under their guidance, the team won the 1976 NCAA Division III national championship. Strong also enjoyed success in other areas at the University. He coached the men’s tennis team to 91 victories over 11 seasons and led the women’s tennis team to 53 victories and three conference titles in five seasons as head coach. Strong is a retired associate professor in the University's Exercise Science and Sport Department. He and his wife, Linda, reside in Paupack. The couple has two children, Scott and Chris, and three grandchildren. Named in honor of Peter A. Carlesimo, former University of Scranton coach and athletics director, the Carlesimo Golf Tournament & Award Dinner celebrates athletics at Scranton and honors a person who has made special contributions to athletics and Catholic education. The Golf Tournament and Award Dinner serves as a fundraising event to support and enhance the student-athlete experience at Scranton. To see photos from the event, visit our Shutterfly page. For more information on supporting student-athletes, visit scranton.edu/athleticsfund.